I love this blog! And your plane analogy for Beefheart is spectacularly apt. Decals was my first Beefheart record, found in a cut-out bin at Peaches for under $3 in 1982. I bought it and Blonde on Blonde the same day, which was a really good day. I had already heard Doc at the Radar Station, and I knew the Magazine version of “I Love You, Big Dummy,” but I was really prepped by an article in either Trouser Press or Cream or, heck, maybe it was New York Rocker, that discussed his influence on so many of the records I already loved. To this day, the title track of this album is my fave from Don Van Vliet. Thanks Steve. It’s hard to pin down Don’s music, but we gave it a go. Blonde on Blonde and Decals on the one day is as you say, a pretty good haul. And Doc – what a place to start! Ashtray Heart is my fave on that one. Even then he was miles ahead! 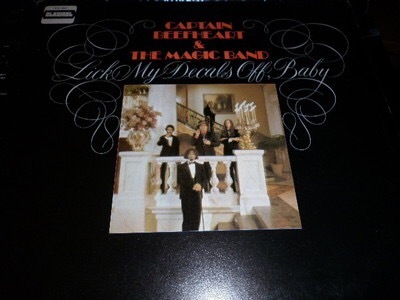 Beefheart is a genius and Lick My Decals Off was his best!! Superb! !